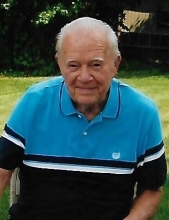 THOMAS A. ZWINAK, World War II Army Veteran; beloved husband & best friend of 66 years to Adelle (nee Prunchunas); loving father of Susan (Carl) Wagner & Robert Zwinak; dearest grandfather of Kimberly (Greg) & Cheryl (Kevin) Hayes; devoted son of the late Mary (nee Valunis) & late Dominic Zwinak; dear brother of the late Joseph & late Mary Zwinak; fond uncle and great uncle of many nieces & nephews. Thomas served proudly in the United States Army during World War II. He was also a member of Willow Springs Seniors & Pleasantdale Park Forever Young Seniors. To send flowers or a remembrance gift to the family of Thomas A. Zwinak, please visit our Tribute Store. Family and friends are asked to gather at St. James at Sag Bridge at 9:15 a.m. for the 9:30 a.m. Funeral Mass. "Email Address" would like to share the life celebration of Thomas A. Zwinak. Click on the "link" to go to share a favorite memory or leave a condolence message for the family.